Specific Digestive Support FIW Wet Food Trays for Adult Cats are complete and balanced meals for cats with digestive problems to ensure they get all the nutrients they need. Made with a high content of minerals and fat soluble vitamins to compensate for the reduced absorption during periods of digestive upset, the food also contains highly digestible ingredients that maximise nutrient absorption into your cat’s digestive system. Pork, Fish, Rice, Egg Powder, Sunflower Oil, Minerals (including Zeolite), Vitamins and Trace Elements (including Chelated Trace Elements), Psyllium, Fructo-Oligo-Saccharides, Dextrose, Xylose, Taurine, Yeast (Source of Β-1,3/1,6-Glucans and Mannan-Oligo-Saccharides), Methionine, Yucca Powder. 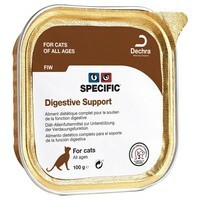 I bought this for my elderly cat who was diagnosed with pancreatitis 8 months ago. The vet suggested royal canin sensitivity wet or dry food, however my cat did not take to it that well and was refusing to eat it, therefore I was throwing it away most of the time. I have tried Hills special diet foods for cats with pancreatitis and related digestive problems but again my cat went off it and was still slightly suffering with diarrhoea. I bought this one specific digestive support in wet and dry and her stools have been worse than ever, she will eat it which is a plus but she is unwell later with bad diarrhoea, vomiting and I can only imagine some pain. Our Siamese suffers from pancreatitis so most food is unsuitable for him. Normally he has to have plain boiled chicken and fish- this is the only packet food he can keep down, so adds a bit of variety. Plus, he will happily take his medication if it's mixed in with this!